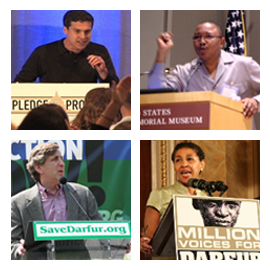 After reading my previous post a Darfur advocate came back to me with a sound point that deserves incorporation. Namely that in addition to distorting the field in terms of U.S.-based advocacy asks, Abdalhaleem’s comments (and those of the same genre) serve another function – trial ballooning for, in particular, a regional audience. In other words, put an outrageous statement out there and see what comes back. If the African Union doesn’t object, there’s a useful piece of information about how far Khartoum can go and still maintain some allies. You may say that such statements could serve the same purpose in reference to the U.S. (and that therefore contrary to my prior post we should all be jumping on them). The reason I would differentiate the audiences is that I don’t think there’s a question for anyone in Khartoum that throwing out the peacekeepers would be objected to by the U.S. There’s no trial balloon function when you know the result. Do we know the result of the US? I can’t tell if your hinting that we would do the right thing or not and I fear that even with the Obama Administration and our energetic envoy that our response would be all too hollow if Khartoum seriously considered booting our peacekeepers. I’m just judging based on the weak response to most other major events in Sudan, specifically after the expulsions of the NGOs and the various times peacekeepers have been killed in Darfur. Can you clarify? And if you think the response will continue to be weak… what will it take for their to be outrage over the mistreatment of peacekeepers? Of course the question is what will it take to have more robust responses to the absurdity of Khartoum… but attacks on and mistreatment of peacekeepers I think is one of the most egregious of crimes currently transpiring in Darfur.